Every Windows Operating System has a lifecycle. 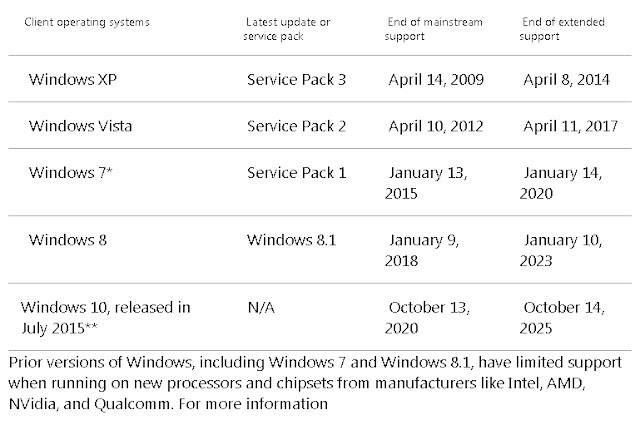 The lifecycle of Operating systems begins with when a product is released and ends with when it's no longer supported from Microsoft. This post is help to you to Knowing dates of operating system when it’s no longer supported to changes your operating system like upgrade or change to latest version of operating system. Its informed to take a decision to change your OS. End of support means the date when Microsoft Company stopped automatic fixes, updates, or online technical assistance, online troubleshooting. When end of support date is arrives time to make sure you have the Operating system installed or upgrade your service pack. Without Microsoft support, you will not receive any security updates and online help that can be effect to protect your Personal Computer from Trojans, harmful viruses, malware, spyware, and other malicious software that can steal your personal information. For more information go to Microsoft Support Lifecycle.